Crampbark is a large, handsome, upright shrub or tree; to 12 feet high; leaves maple-like, with 3-5 lobes, hairy beneath. The leaf stalks have a narrow groove, and a disk-shaped gland. Leaves have three lobes and are broadly wedge-shaped. 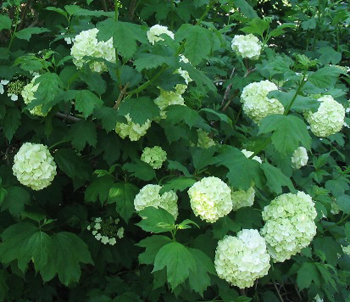 White flowers in a rounded head, to 4 inches across; April to June. Flowers are showy and are succeeded by red, very acid berries, resembling low cranberries, and sometimes substituted for them. Flower clusters have inner fertile flowers, outer sterile ones. They remain on the bush after the leaves have fallen and throughout the winter. The bark has no smell, but has a peculiar bitterish and astringent taste, which leaves a clean taste in the mouth. Viburnine is the active principle found in the dried bark of the stem. Found in the northern part of the United States and Canada. Grows in low rich lands, woods, and borders of fields. This plant was well known to the Native Americans. Crampbark was also a favorite of the horse and buggy doctors. They were known to say, “make a strong tea of the high cranberry bush bark, and drink 1/3 of a tsp. and it will stop cramp in 20 minutes”. To prevent recurrence of the trouble they suggested drinking the tea night and morning for a couple of weeks. As the name implies, crampbark relieves cramps and spasms of involuntary muscular contractions such as in asthma, hysteria, convulsions, cramps during pregnancy (preventing the attack entirely if used daily for the last 2-3 months of gestation. Also, relieves dysmenorrhea, labor pains, headache, neuralgia, earaches, epididymitis, lumbago, miscarriage, paralysis, tubercular lungs, with honey for high blood pressure, heart conditions, bladder, constipation, stomach cramps, cough, cold, fever, flu, sclerosis, eczema, scrofula, and skin conditions. The low cranberry and possibly the high cranberry is known to be a direct medication for erysipelas. If applied early, externally, this condition yields at once. Also for malignant ulcers and scarlet fever when applied to the throat. Pound the berries and spread them in a fold of old cotton cloth and apply over the entire diseased surface and the inflammation will speedily subside. Its usefulness is universally acknowledged. In China, leaves and fruit are used as an emetic, laxative, and antiscorbutic. Infusion: steep 1 tsp. of the cut bark in 1 cup boiling water for 30 minutes; when cold, drink 1-2 cups a day. The berries are rich in vitamins C and K.
Berries are considered potentially poisonous; they contain chlorogenic acid, beta-sitosterol, and ursolic acid, at least when they are unripe.